Instructors will use a $15,000 grant to create a Science, Technology, Engineering and Math (STEM) summer program for local middle school students. 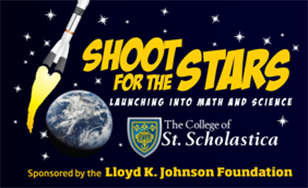 The Lloyd K. Johnson Foundation has provided St. Scholastica with the funding, which will be used for a new program called Shoot for the Stars: Launching into Math & Science. The purpose is to create interest in STEM fields with a week-long summer program followed by the creation of a math/science club to cultivate engagement throughout the school year. Research has shown that interest in STEM fields typically drops off during the middle school years, making this a key time for educators to engage students in these critical subject areas. "STEM subjects teach students how to think logically, work methodically, and address complex problems from various angles," said program director Donna Kirk, a math instructor at St. Scholastica. "Through experiencing summer and academic year activities, students at this important transitional point may begin to see STEM disciplines as fun and interesting." Organizers hope to create a group of STEM-engaged students who will influence their classmates through positive peer pressure. This is particularly important at Lincoln Park Middle School, which serves a largely low-income student population. Thirty students will be selected for this program. All current sixth- and seventh-grade Lincoln Park Middle School students are eligible to apply and will also be chosen based on recommendations from teachers and advisers. Starting Monday, June 13, the Shoot for the Stars Summer Institute will feature a week of science and math lessons and activities, with topics including rocket aerodynamics, radar mapping, cryptology, rocket propulsion and construction, and a variety of activities such as scavenger hunts, a tour of St. Scholastica, and group bonding games. The institute will last from 9 a.m. to 3:30 p.m. each day, and would be held on the St. Scholastica campus. Faculty members Tim Trygstad, Brendan Miller and Allen Chapardza are assisting with the programming for the summer institute. Faculty and staff at Lincoln Park Middle School will work collaboratively on the summer project, which will be supplemented throughout the following school year by monthly Math/Science STEM Club activities co-facilitated by St. Scholastica and Lincoln Park Middle School faculty.